Thanks Griff! I like it, and will change my vocabulary accordingly!! It goes along well with another of my favorite sayings: "Those who seek to idiot-proof society underestimate the ingenuity of fools." Good question, thanks. I'm looking for the shooter's point of view. The Pozo River Villagance Comittee at Lazy Arrow (my home club) is holding our Fourth Annual Lazy Arrow ShootOut, and we want to make it a great time for as many shooters as possible. Check out our Video (featuring yours truly). So far we're hitting most of what's been mentioned here; plus our range is in the middle of a 32,000 acre working cattle ranch, and our Sherrif has his own herd of American Bison that we get to enjoy. Come way out West and shoot with us! Enough with the horseplay, quit foaling around! It's time to put this thread to pasture, we've herd enough and strayed from the mane topic over two, neigh, three pages. We've discussed all this with unbridled enthusiasm, but I canter-magin there's more to say. I'm getting horse, so it's time to head for the barn and hit the hay. What are your top five reasons for attending annual matches? Here are some I've heard: Seeing old friends Broader competition Making new friends Chances to win buckles and awards Different and fun stages Side matches Dinners & campgound activites Swap meets Vendors More time to visit with friends Fun theme Location What else gets you there and makes you glad you came?? Well Allie Mo, we always strive to keep all our TOs polite and on their best behavior at PRVC, and we look forward to shooting with you at the Lazy Arrow ShootOut in May!! The best way I've seen clubs head off problems with a TO of "questionable skill or integrity" is for the posse leader to select and announce the specific folks who will be running the timer on their posse that day. As we've discussed already on this thread, clarity and communication can prevent a lot of unpleasantness. Ooops, sorry if I digressed OWM! Thanks for keeping us on track, in that spirit... Here's what I have learned from the answers to the OP: There are no defined conventions for "at the ready" or "in hands" other than their literal meaning. It's all about the stage instructions, what do they say? When writing stages, be specific if you want the shooter in a specific position (rifle shouldered and on target), or keep it simple if you want to let the shooter have some options (rifle in hands = any way they want to hold it as long as it's in both hands and safe). Does that sound about right? 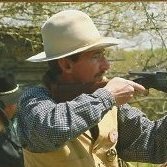 The way I was taught, "safely assisting the shooter through the course of fire" includes assessing the shooter's readiness to shoot the stage: assessing the shooter's gear (they have all their guns, hammers down, SG shells, loops off pistol hammers, etc. ), assessing the shooter's composure (are they ready and understand the stage), seeing that all guns are staged correctly, and that the shooter is in the correct location and starting position. Yes, it is ultimately the shooters responsibility, but a good TO can do all that checking without saying a word if all is well. I enjoy shooting under a TO that I know is looking me over and looking over my shoulder but is only seen or heard if I need it. When running the clock, it's a good day if I can save someone a P or worse! That was the motive that started this thread, being educated and prepared to do the best we can for the shooters under our charge when we're running the clock. If I am fading or not doing a good job, I will ask for relief. If my friends and I see a TO making mistakes or losing focus, we offer to relieve them pronto; most folks I've met take the responsibility seriously. Everyone taking personal responsibility is what makes CAS so refreshing, we own up to our mistakes whether as shooter or TO, right? Hi Allie Mo, while I like the first better than the second, when we hold the timer we all should strive to do our job of "safely assisting" to avoid having to apologize! Thanks for sharing your experiences, I don't get to as many matches as I would like, but the helpful dialog on the Wire is a great way to stay sharp and encourage each other to do well. The plot thickens!! Regarding the penalty question, A diligent friend pointed out this quote from the ROI Student Handbook, page 47: While the TO should do his/her best to not start a competitor in a faulted position or location, the ultimate responsibility of starting position lies with the shooter. A shooter who starts in a faulted position will be assessed a Procedural penalty. Very helpful comments! Being fairly new to the game, it is a huge help to have you all fill-in-the-blanks regarding interpretation of the SHB and RO courses. As Snakebite said "No rule book can cover every possible 'what-if' situation... it takes common sense." The wealth of information shared on the Wire really helps clarify the practicality of how the rules are applied. Your willingness to share and help develop common sense and personal responsibility in our sport is what sets it apart and makes it such a good time. Thank you for the discussion and education. The main concern was the definitions of "at the ready" and "in hand". I couldn't find them in the SHB, and wanted to know if there was a convention I was unaware of. As BS said, the terms mean different things to different people, so clarifying is important. Thanks to all for clearing that up. Thanks for the reply Phantom, I suppose if the TO insisted the instructions were to shoulder the rifle and the shooter refused in order to gain the advantage of a faster reload the only possible call would be "Spirit of the game" and not a "P" since it was intentional and Procedurals are for unintentional mistakes? Or am I missing your point?